Tyshawn Jones is the future of skating. He’s also the Bronx’s newest restaurateur. It’s your classic New York City takeout/counter spot, but beyond the glass separation wall and the hot food trays and the dollar bills taped above cash register (signed for good luck), there’s a surprisingly spacious kitchen turning out food that would pop, even if there wasn’t a paucity of quality options in the area. 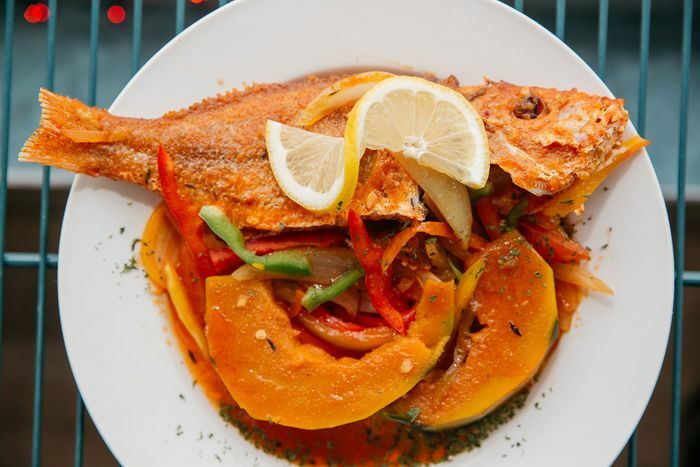 Overseen by Robert Bailey, a versatile chef originally from Jamaica, the Caribbean-American menu ranges from hearty mac ‘n’ cheese to grilled chicken salad; perfectly tender oxtail; classic plates of jerk chicken and curry goat; sauteed shrimp and red snapper; and nicely spicy Rasta Pasta. 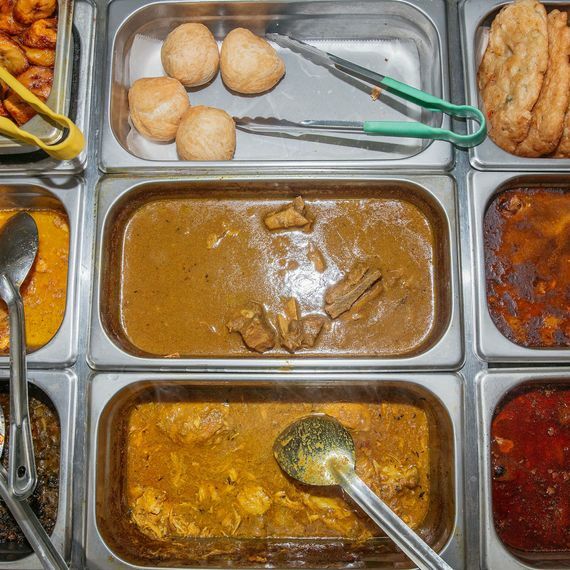 While waiting on their orders to be placed on the plastic spin-tray, customers animatedly FaceTime (“You mad fake, bro … hi, Tina!”), try and finesse some freebies (“Can I get an extra piece of chicken in there …”), or learn about ackee (“What’s the yellow stuff with the saltfish?”). Through the big front windows, diners can watch dudes smoke cigarettes on Lafayette Avenue, and nuns from nearby Soundview Presbyterian run errands. On the day I visit, a young Tyshawn Jones fan is in the room. He’s a quiet, curly-haired kid named Evan with a Supreme Hellraiser keychain fashioned into a necklace. He’s from Westchester, and since his mom dropped him off this morning, he’s been waiting patiently to meet his hero. When Jones does walk in, he immediately daps up the kid, and takes the deck Evan brought for him to sign. Confusedly, Jones notices another signature already on it. 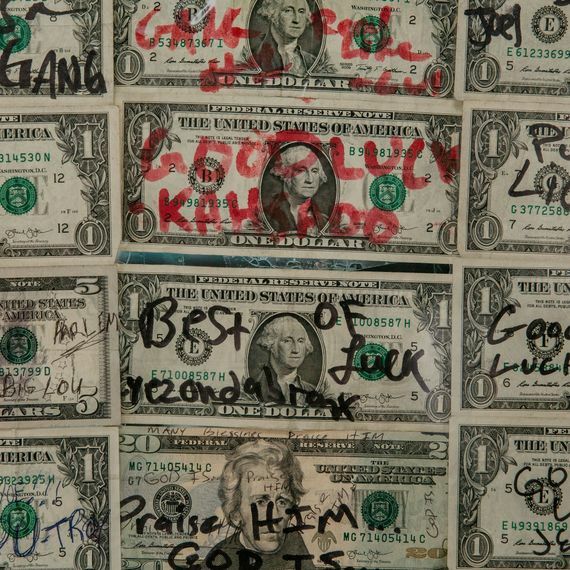 A snapper plate; steam trays; dollar bills signed for good luck. Scott Heins. Jones was in elementary school when he first fell for skateboarding. It happened via the video game, Skate. (“Me and my brother stole it from our cousin’s house,” he remembers.) Henry gave him some money for boards, and it was on. Through the frustrating process of trying to learn new tricks, Henry says, “he used to cry tears — literally tears — but he never gave up.” Quickly, Tyshawn became obsessive, and very, very good. Henry says, “I mean he would come home, that book bag dropped — and he was goooone downtown.” He’d be away for hours, and Henry would worry constantly. “Now he’s tall. But before, he was little TJ!” She knew, though, that she had to let him pursue this, so she’d let him stay out skating for hours and hours as long as he’d check in every 15 minutes. 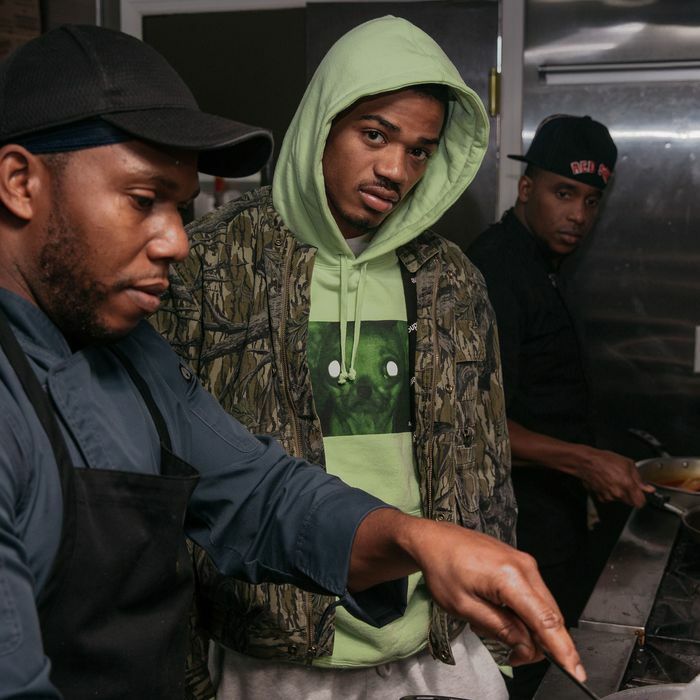 Since he was 10, Jones says, he knew that he was going to push skateboarding as far as it could go and then, in his words, “flip it and flip it — gotta set up this family tree, so everybody set for life!” Opening a restaurant was a bucket-list item that the mother-son duo dreamt up years ago. Early this year Henry was driving down this stretch of Lafayette when she saw a “For Rent” sign on the space and excitedly called Tyshawn, who was on tour skating, telling him she’d found the perfect location.